A town on Ethiopia’s border with Kenya is on edge after Ethiopian security forces shot and killed 10 people and injured 11 others Saturday, the mayor said. Residents of Moyale, along with the Command Post, the military unit overseeing a recently enacted state of emergency, confirmed the casualties in the southernmost part of Oromia, a region gripped in recent years by protests and government crackdowns. By most accounts, the attack was sudden and unprovoked. Armed security forces began shooting Moyale residents in the streets and in shops and restaurants, killing and injuring apparently innocent people, most of whom were in their 20s. Moyale’s mayor, Aschalew Yohannes, described how the attack began. “A young man was on his motorbike, and security forces stopped him and shot him,” Yohannes said. “After that, they were shooting at everyone in the town. What we have confirmed so far is that there are 10 people killed and 11 people injured, and of those five have gone to Hawasa,” he said, referring to a town more than 400 kilometers (249 miles) north of Moyale. It isn’t clear why Golo Waqo, the man on the motorbike, was stopped and shot. He may have been participating in a peaceful protest, according to Yohannes. After killing Waqo, the security forces continued shooting people in the busy district. Tamam Nageso, principal of a school in the area, was returning home for lunch when the attack unfolded. The 34-year-old husband and father of one had just completed a morning of parent-teacher meetings at the school. The award-winning educator was walking home when a bullet struck his leg. He fell down but managed to get back up to run for safety. The bullets kept flying, and Nageso was shot twice more. He died in the street. Residents say the attack was unprompted, and the victims were simply going about their daily lives. “There is a church around here, Abune Aregawi, and there are shops, residential places and restaurants,” one resident told VOA by phone. The woman said most of those killed were young, but two elderly people also died. The victims came from different ethnic groups and were going to and from work and carrying out their days in the Shewaber district, she added. The Ethiopian government has characterized the attack as a mistake due to bad intelligence. Soldiers received a dispatch about possible activity involving the Oromo Liberation Front (OLF), according to General Hassan Ibrahim, who spoke to FANA, a state-owned broadcaster. OLF is a militant opposition group that wants the current government, which considers OLF a terrorist organization, removed from power. It was based on that dispatch the general said, that soldiers began attacking people in Moyale. At a press conference for local journalists, a Command Post official confirmed that security forces had killed nine people in the town and injured 12 others. After the briefing, one injured person later died. Yohannes, the mayor, found the purported mistake implausible. “It is known that OLF sometimes makes some movements through the Kenya border in the past, but there is nothing that connects this incident with OLF,” Yohannes told VOA Amharic. The Command Post expressed deep regret for the attack and said it is investigating five people, including the person in charge of the security forces believed to be responsible for his incident. Yohannes said the Command Post and local security forces aren’t in close contact, making it difficult to get answers. He called for a meeting to ensure voices from his community are heard and has lodged complaints at every level of government. “As the mayor of this town, I would say that this should never happen to enemies, let alone citizens. This has to be improved totally — that’s what I believe. And the people are scared now due to what happened, so it is a really difficult situation,” he said. VOA’s calls to government officials were not returned. Yared Hailemariam, the executive director of the Swiss-based Association for Human Rights in Ethiopia, criticized the government’s response. Hailemariam said the incident in Moyale reflects the free rein given to security forces. Asking for forgiveness and investigating those directly responsible aren’t enough, he said. “They should hold to account not just the four to five people who are part of the security forces, but the authorities on top at the federal level leading the Command Post should be questioned,” he told VOA Amharic. Multiple sources told VOA that the attack resulted in large-scale displacements, with residents in fear of their lives fleeing over the border into Kenya. 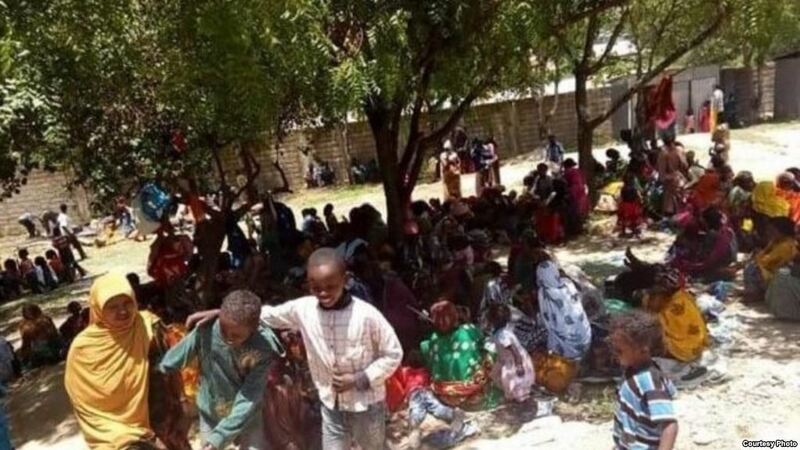 One man who crossed into Kenya told VOA Amharic that he thought 2,000 people were staying in the area and said that most of the displaced people are children and women. Another resident who fled has 13 children. The government had declared a state of emergency on February 16 to stabilize the country following continued protests and unrest.